Quo usque tandem abutere, Italia, patientia nostra? Quam diu etiam furor iste tuus nos eludet? Quem ad finem sese effrenata iactabit audacia? To a foreigner it is hard to understand how police works in Italy. There are five branches of national police, all of them uniformed and armed. Sometimes it seems we live under martial law, such a number of uniformed people on the streets. Polizia di Stato: federal police, mostly uniformed and always armed. Carabinieri: military police, in uniform and with guns,directly involved into civil policing duties. Guardia di Finanza: customs police, uniformed and armed, normally involved into white collar crimes. Imagine people from IRS with guns. You got it! Besides those national organizations, there are Polizia Provinciale (state police, somehow), Polizia Regionale (another kind of state police) and Polizia Locale (city police). Each of those organization has its particular uniform and colors. And each police officer is allowed to ask for your ID anytime he wants to. So, there is always an oppressive atmosphere in Italy, strengthened after the recent elections, when Lega Nord, a fascist party, won most part of the power in Italy. So, in Italy, if you are a foreigner, you are a potential target to an offensive treatment. If you are not from EU, it is even worse. If you are black, be prepared to be treated without any respect. Seems like a fascist or racist country? Maybe sounds funny. But living here you can feel the fascism rebirth. 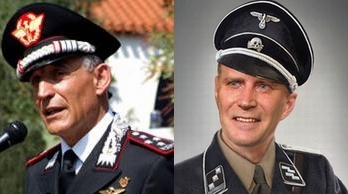 Just for curiosity sake, the image below show how a Carabinieri uniform is similar to a SS Nazi uniform. It is amazing how the cap is almost identical. Fascist Italy again? This entry was posted on Jun 07, 2008 at 12:00 and is filed under Daily Life, Paradoxes with tags Carabinieri, Corpo Forestale dello Stato, Fascism, Fascist Italy, Guardia di Finanza, Italian Police, Italy, Lega Nord, Polizia di Stato, Polizia Penitenziaria, Racism. You can follow any responses to this entry through the RSS 2.0 feed. You can leave a response, or trackback from your own site. Came across your post as I was researching the European Gendarmerie Force. So, looks like the Italian contribution to the EU police state will be a group of keystone cops. Thanks for your work on this. You’re very very silly or very very new to Italy! “Polizia di Stato” and “Carabinieri” are similar: the first one is NOT a federal police. Simply one responds to Ministry for Internal Affairs and one to Ministry of Defense (in fact Carabinieri is also our “military police”). Both guarantee daily security in our cities. Polizia Forestale depends to Ministry for Agricolturals. It’s responsible only for parks and for things related to farmings. “Polizia locale” is another term to talk about “Polizia municipale”: this is the local police responsible for traffic and other burocratics things in every city. “Polizia provinciale” and “polizia regionale” are not so common, they have few agents and manage mostly burocratic things. In Italy – in the REAL Italy – none of aboves never stops you to ask for ID: only Polizia di Stato and Carabinieri do this! Sometimes Polizia municipale (in case of some city events, to enforce local control and when you get a traffic fine!). Maybe Guardia di Finanza but only if they’re looking for unauthorized traffics near shores or borders. In every ohter modern country you can count a lot of “policies”, it’s not so strange. This is NOT a police state, guarantee. Once more thank you for the comments and for the opportunity to make my argument even clearer. Yes, I am silly and I am new to Italy. But even being so, I am also capable to identify a stupidity when one hits me, as it happens so often in Italy. Sorry about that, but the issue is not me, it is Italy’s aversion to a functioning brain. In the last paragraph, firstly you state none of aboves never stops you to ask for ID. Then you say only Polizia di Stato and Carabinieri do this and Sometimes Polizia municipale and Maybe Guardia di Finanza… That is, in your own words, except for Polizia Forestale and Polizia Penitenziaria any other branch can ask for my ID. I mean, provided I am not a tree, neither an inmate, any police officer I met in the street can ask for my ID. check out http://fotios.org/node/2182 and browse the site in general. Visited Rome, Florence & Venice in June 2009. Was totally confused by the different police everywhere. The Carabinieri were usually tall & strapping fellows, well groomed & smartly dressed…. and THE MOST ARROGANT of the lot. At Piazza Navona, 2 Carabinieri strutted past 5 Polizia Municipale and they didn’t just look down on the Polizia Municipale…they didn’t even bother to glance or nod to them. The Polizia Municipale were balefully eyeing the Carabinieri with hostility as they swaggered past and I could see them muttering under their breaths too!! The Guardia di Finanza are equally well groomed & talilored but equally as OBNOXIOUS as the Carabinieri. They were guarding the Castel D’Angelo (don’t ask me why) and were disdainful & unhelpful to tourists who approached them. What a bunch of a—holes!! And the Victor Emmanuel Monument were guarded by regular ARMY SOLDIERS of the Granatieri de Sardegna, in addition of course to strolling Carabinieri, Polizia del Stato & the ubiquitious Polizia Municipale everywhere!!! Talk abut overkill!!! It all looked so comical and laughable and yet no matter how well or even ridiculuosly dressed, groomed or tailored the entire Italian Police are, they all seem to be packing Beretta Automatics at their sides!! They seem to be expecting a war or something!!! First of all, thanks for your comments. It is always nice to meet another sole who is also able to see the comedy behind this myriad of police branches. You also noticed how well dressed and how poorly integrated is the Italian police. I mean, they spend most time showing off their uniforms among them than looking after criminals. Hmmm, I’ve read how in WW2 Italian officers were wore tailored uniforms and were always well groomed compared to their rank & file ordinary soldiers. In the movie, Captain Corelli’s Mandolin, this disparity is clearly demonstrated. The Germans of course had plentiful cause to doubt the value of such fashionable uniforms in modern warfare. The Carabinieri may be decked out like peacocks but don’t let the splendid outfits fool you. They are indeed an efficient and effective police force. Certainly the locals have a great respect & fear of this particular police. As a separate matter, the Italians do have that sense of enjoying life, the sunshine, food, drink , love and not taking anything so seriously. After touring Europe I have come to the conclusion that the Italian outlook is not altogether comical, ridiculous or wrong. In fact I’d say the Italians have mastered the true meaning of life and living it to the fullest. If only the rest of the world embraced the same culture we’d have far less stress/turmoil everywhere. Viva Italia. i’m italian, i know eveything about police corps because i have to know for my job. please if you dont’n know shut up, this is ignorance about a system who’s the better of the world in a place where there’s the most pericolous criminal society of the world.talk with an italian policeman and learn the difficulty to work in this contest…you don’t know nothing….don’t do bad advertisement…here i read many stupid thing, peolple that don’t know and don’t live the situations but describe only the apparences…who are ridicolous? pitone sono sempre d’accordo con te…qua si parla e non sanno un bel niente di come va…probabilmente questo sito sarà fatto da qualche italiano a cui piace sputare sul tricolore..vergogna! Mark, for thanks for stopping by. I am afraid you did not get the issue here. I mean, for someone used to a, let’s say, conventional police force, Italian multitude of police branches is confusing. I did not mean the Italian police force is good or bad. I said it is poorly organized, divided into many potentially competing different units, which lead to lack of focus. Well, those Carabinieri fellows all look as if they just walked out of Gucci but don’t let the splendid outfits fool you for 1 second. The Carabinieri are VERY professional and tough Mothers as well. The other incredible thing abt Italy was when we got off at Fiumicino airport, the Immigration Officers didn’t look or stamp our passports. Hundreds were just waved through the checkpoint. I thought that was odd but the real surprise was there were no Custom Officers to check our luggage either!! We could have been carrying bazookas and nobody wanted to know!! We walked straight out of the airport and caught a taxi to Rome!! Just like that!! Of course when we left Europe via Munich, those Teutonic German Immigration Officers gave us a hard time bcos we did not have the correct Entry stamps on our passports when we arrived in Europe!! You have to admire and hate those Krauts for their obsessive efficiency! !